It’s almost time for that big candy haul called Halloween. You know what I mean, the day the kiddos get dressed up into something magical and go racing door to door to see what sweet treats they can score. The challenge is what do you put this amazing booty in? Well, if you were like me as a kid, you carried around a standard issue pillowcase and clearly, that will just not do these days. I can not remember the last time I actually saw a child ring my bell with a pillow case. 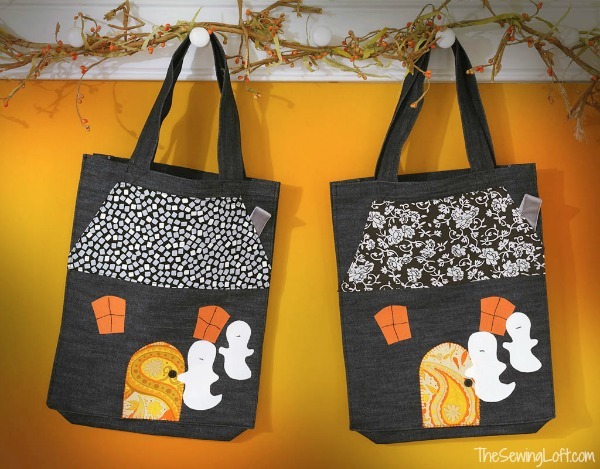 Well have no fear, even if there is no time left in the day to stitch together a new Halloween tote bag, you can embellish that pillowcase with this template. Just iron and go! Appliques can be attached to almost any surface including tote bags, pillowcases, placemats and more. 1. Trace ghost, door, and window applique templates onto paper side of double-sided fusible. Position and fuse in place following the instructions on the packaging. *Before fusing the roof in place, fold the ribbon in half and sandwich it between the fabric and roof. 2. Machine stitch all around roof to secure the chimney in place. Consider adding decorative stitching to other appliques like windows and ghosts. Attach button on door (for doorknob). Knot and clip thread ends. There is no seam allowance so take your time, cutting counts. Reducing stitch length is recommended around smaller curves like the shape of the door. Template will print in the mirror image to make for easy tracing. Consider print placement when applying fusible. 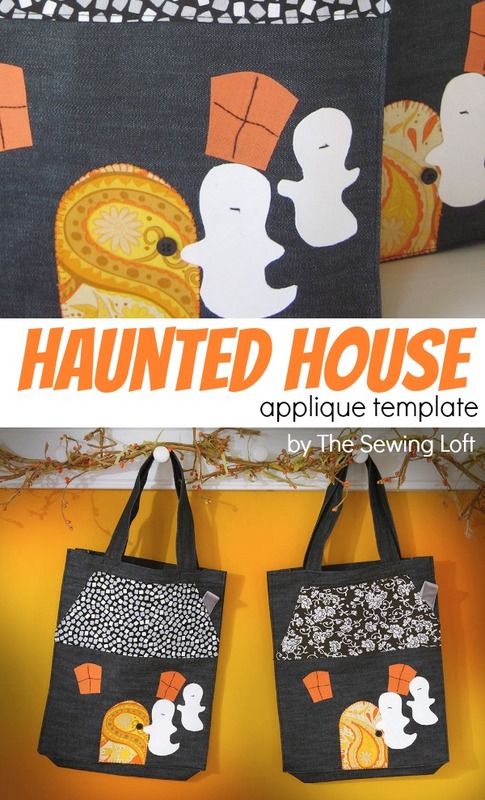 What will you make with your haunted house applique?